With summer here and several fun get-togethers coming up (a 4th of July party included) I have been working on creating a few fun recipes and drinks perfect for celebrations that are fun and festive without being too much work. 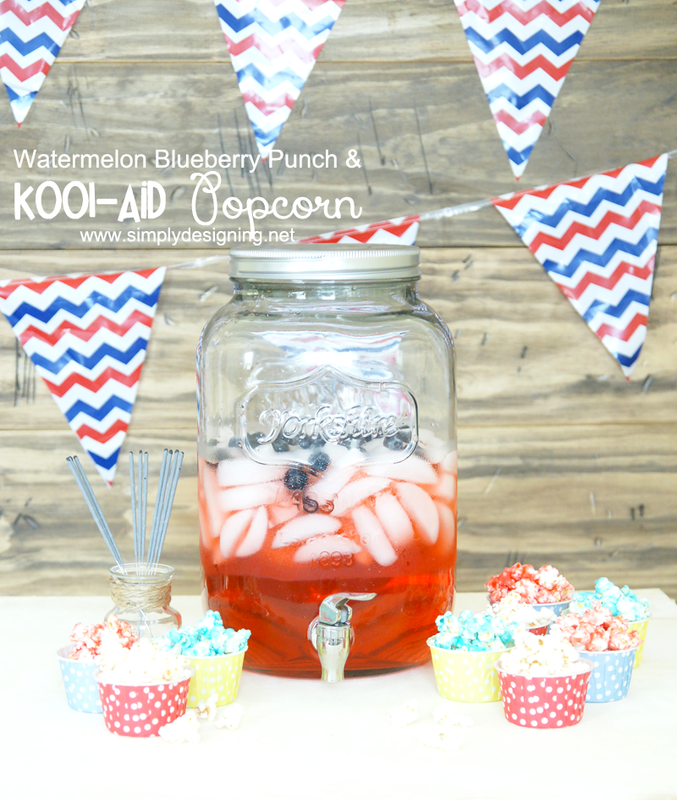 So today I am thrilled to show you how to make Kool-Aid Popcorn and Watermelon Blueberry Punch! 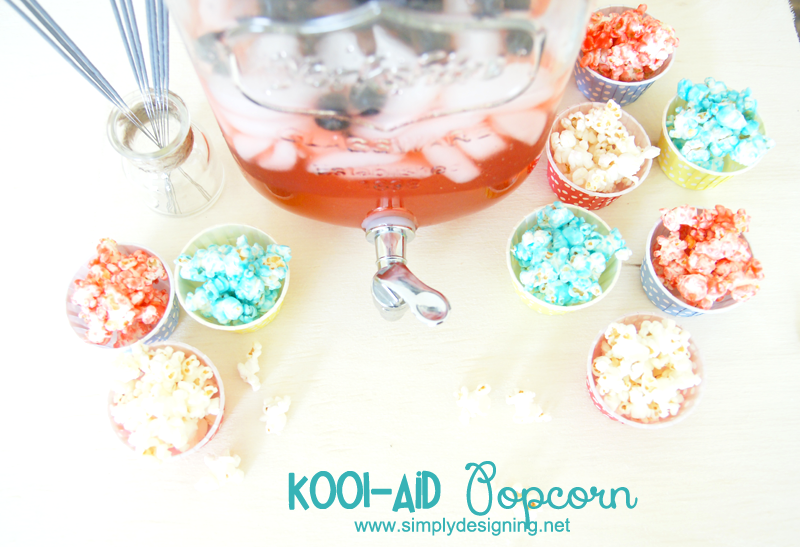 Both the Kool-Aid Popcorn and the Watermelon Blueberry Punch are incredibly simple to make! 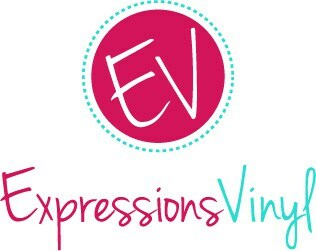 They can be prep’d ahead of time which makes it perfect for any party. And these are treats that the whole family will enjoy! About 24 hours or so in advance, lay the washed and dried blueberries out on a cookie tray and freeze. A few minutes before serving, pour the Watermelon Kool-Aid into a pretty container and add ice. Top with frozen blueberries and enjoy! My local store had a great selection of Kool-Aid and the new 96oz bottles come in some yummy looking flavors! 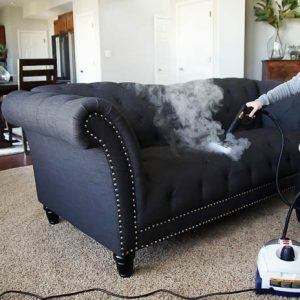 First you will want to pop your un-popped popcorn. 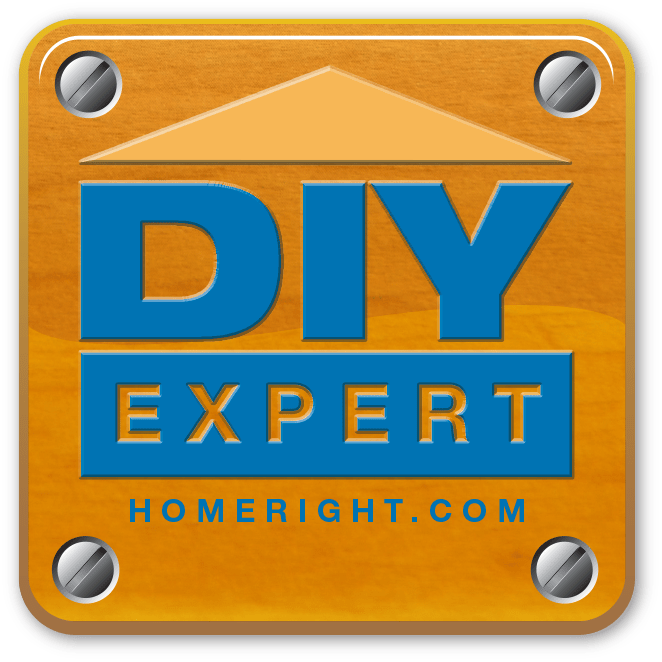 Remove any un-popped kernels. Over medium-high heat, place sugar, butter and corn syrup in a heavy duty pan and bring to a boil. Boil for about 30 seconds and remove from heat. 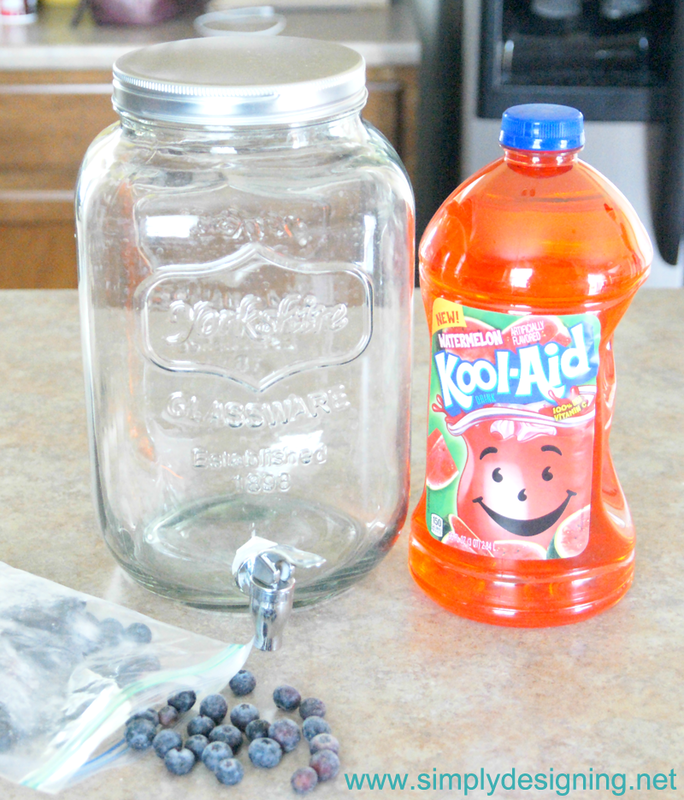 Add in 1/4 – 1/2 tsp Kool-Aid powdered mix of your choice to the sugar mixture and mix well. 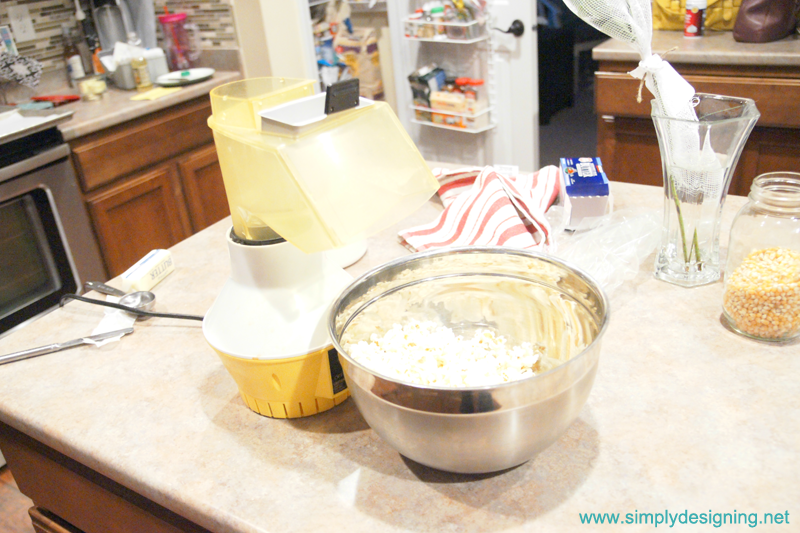 Pour hot sugar mixture over popcorn and stir until evenly coated. Spread out candied popcorn on a lined cookie sheet and allow to set a bit. 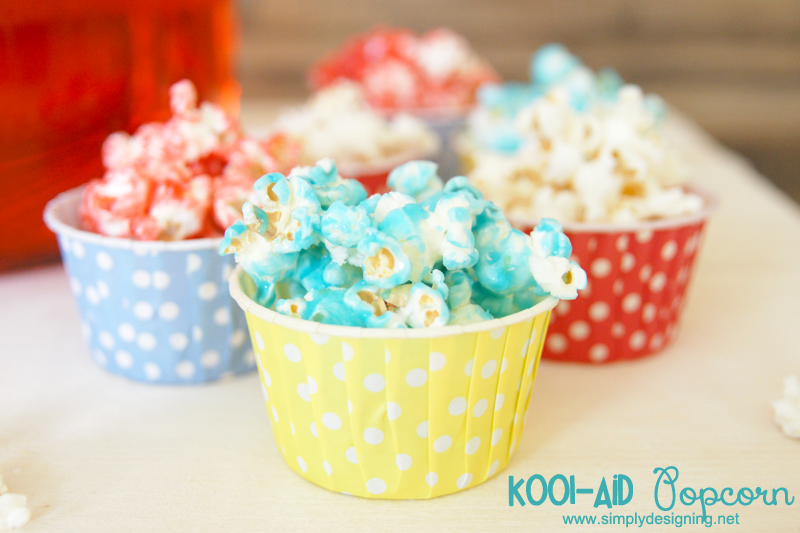 Using Kool-Aid in your candied popcorn not only gives the popcorn a fun and fruity flavor, but it also gives your popcorn a brilliant color as well! This popcorn is not only beautiful to look at, but is really quite tasty! 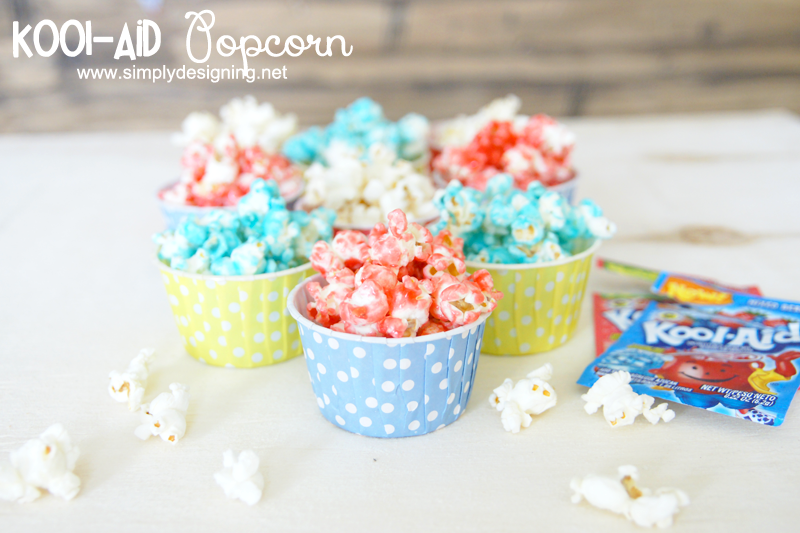 If the popcorn isn’t as brightly colored as you like, you can always add a few drops of food coloring to your sugar mixture prior to pouring on the popcorn if desired. For my patriotic-inspired popcorn I used Kool-Aid’s new flavors, Mixed Berry (blue) and Cherry Limeaid (redish pink) and then I left one batch of popcorn plain (white). But you can use any colors and flavors of Kool-Aid you like! This would be so fun for any party! It is a really fun snack for both adults and kids! 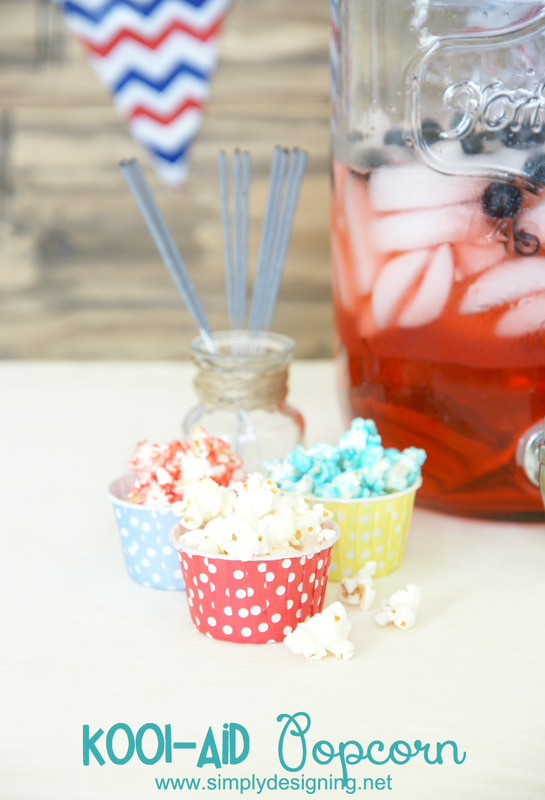 Both this punch and this candied popcorn were amazing hits with my family! They tasted good, were really pretty to look at, and were simple to make! That definitely makes these recipes a keeper in my book! Do you have any fun plans for the 4th of July? These look delicious! Pinning so I don&#39;t lose. Ah thanks so much Sydney! 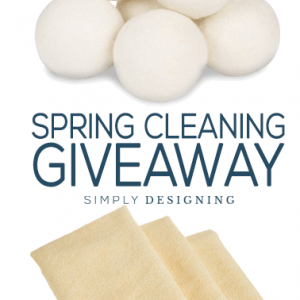 Very easy! Fast! This will be fun to make with the grand babies! I baked for 15 min. At 225 to harden candy coating.<br />Not excessively sugary. Oh thanks so much! And what a great idea to bake it! Oh thanks so much Jenna! I really enjoyed your blog. I am having a Baby Shower for a “girl”, in October. of only red food coloring?